Price with $100 promo code APINSIDER. As always, if you have any issues, you can reach out to us at deals@appleinsider.com and we'll try and help. Refreshed in July, the 2018 13-inch MacBook Pro with Touch Bar has been given quite a few internal changes to make it more useful. The line now includes quad-core processors for the first time, with the base model using a 2.3GHz Intel Core i5 processor capable of up to 3.8GHz when boosted. It can also be configured with a 2.7GHz quad-core Core i7 that can run at up to 4.5GHz. Onboard graphics have been upgraded to Intel Iris Plus 655 from the previous model's 650 version. Base configurations include 8 gigabytes of LPDDR3 memory, but this can be configured to 16 gigabytes when purchased. Internal storage starts with 256-gigabyte and 512-gigabyte SSD options, but the configuration options to increase the local storage has been boosted up to 2 terabytes, up from the previous limit of 1 terabyte. The display is a 13.3-inch 2560-by-1600 wide color (P3) screen, but this time it includes True Tone, Apple's technology that allows for images shown on the display to appear the same to the user despite changes to the lighting of its surroundings. A new feature to this year's refresh is a change to the keyboard that introduces a membrane to both quieten typing and to protect the butterfly mechanism from jamming. Above the keyboard is the Touch Bar with integrated Touch ID sensor, while below is the Force Touch trackpad. 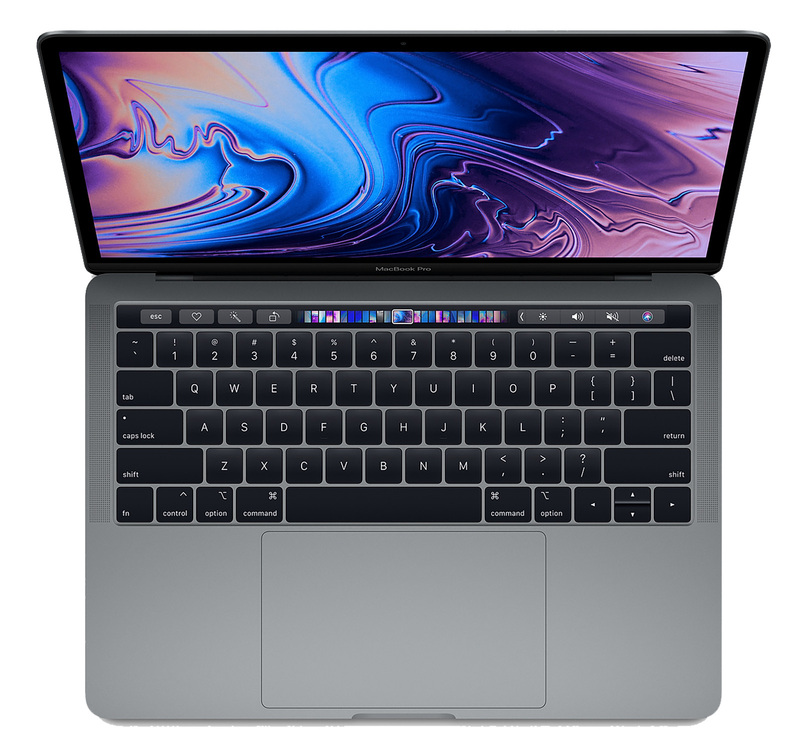 Offered in Silver and Space Gray finishes, the 13-inch MacBook Pro with Touch also has four Thunderbolt 3 ports with full speed on all connections, a 10-hour battery life, a 720p FaceTime HD camera, and a headphone jack.